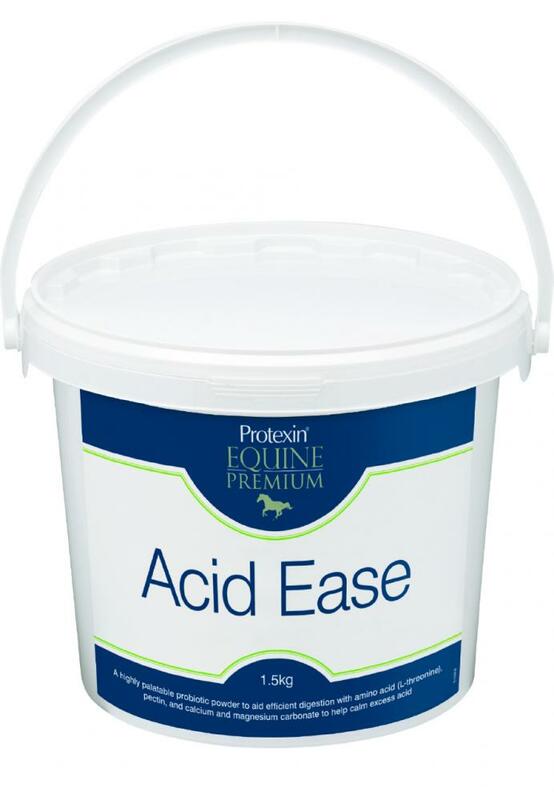 New Formula - Protexin Acid Ease is now 5 times more concentrated than the original formula, so you only need to feed your horse 100g a day or less. It is also now a powder instead of a pellet as field tests proved it was the more palatable form. Protexin Acid Ease is now a concentrated formula which is still as delicious and nutritious. Protexin Acid Ease is now a powder formula which has been developed based on customer feedback. 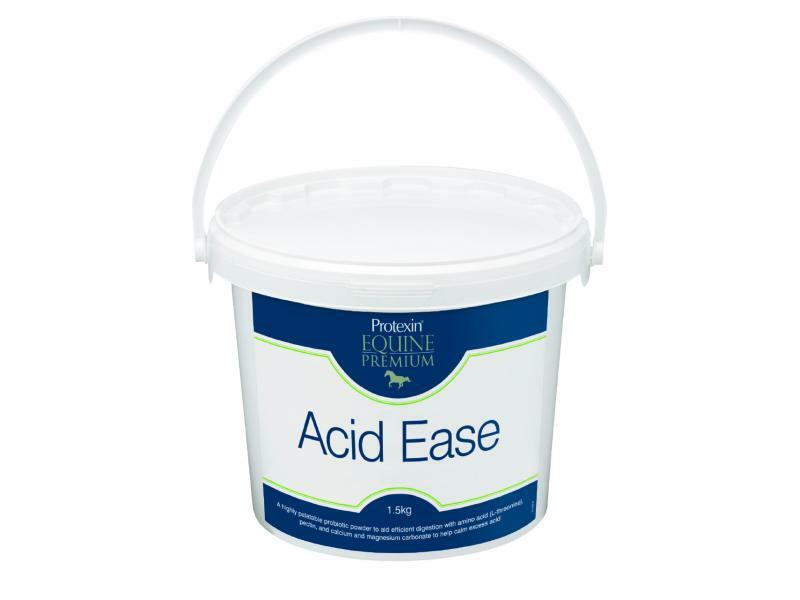 New Acid Ease contains the antacids calcium carbonate and magnesium carbonate, as well as kaolin, pectin and L-threonine which together act to buffer excess acid and help protect and soothe the gut lining. The proportion of the high quality fibres – pectin and psyllium have also been increased to create this superior product. Alfalfa meal, Calcium carbonate [18%], Magnesium carbonate [9%], Psyllium husk, Lignocellulose, Pectin [5%], Dicalcium phosphate, Preplex® prebioitc - (Fructo- ligosaccharide) [2%], Soya oil. Feed 50g twice a day for the first month and then reduce by half as a maintenance. Below are some recent questions we've received regarding Protexin Acid Ease Concentrated Formulation for Horses, including answers from our team. can you give acid ease with a calmer on a regular basis? It should be fine to use these products together. There should not be any sort of adverse reaction and they can both be used for extended periods. I have tried the protexin but it's not working what do you suggest? There are lots of possible causes for what you describe and some are easier to treat than others. I would have to say that if this seems to be a persistent problem then you should get your vet to check things out if this has not already been done. Otherwise I would suggest a good worming dose if this has not been done recently and the product Equitop Pronutrin this can get good results in the situation you describe. Will this heal a stomach ulcer? 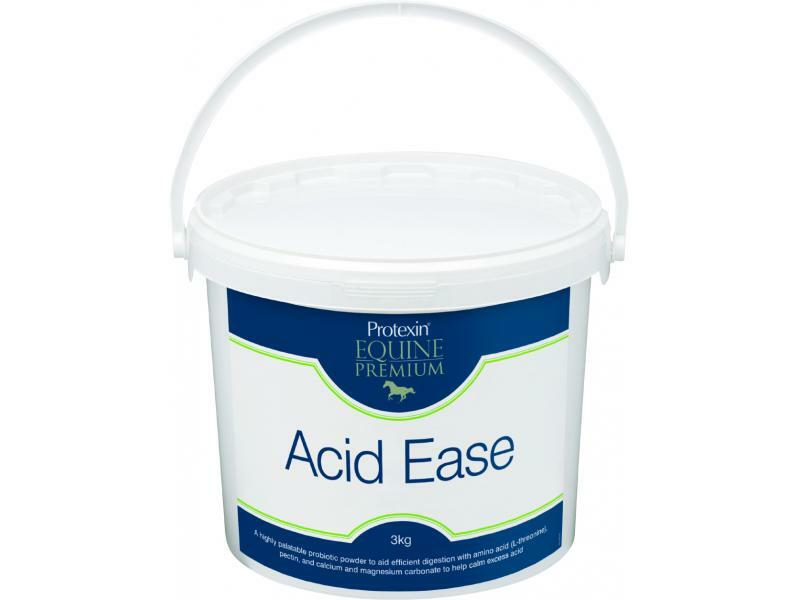 This product is made to help horses with ulcers or prone to getting them. It certainly should help to allow an ulcer to heal. It is not a licensed medicine however, so it has not been scientifically tested and evaluated and nobody is allowed to say that it will definitely heal an ulcer. I am sure it will be a big help. Can you feed protexin acid ease with protexin gut balancer? These products are quite similar and can be given together, though it would probably be adequate to give just the Acid Ease alone. Can this be mixed into a wet feed (speedi beet), or will it lose potency? As long as you only mix it up a short while before feeding, then it is perfectly OK to add to wet feed. This would be the normal way of giving it. 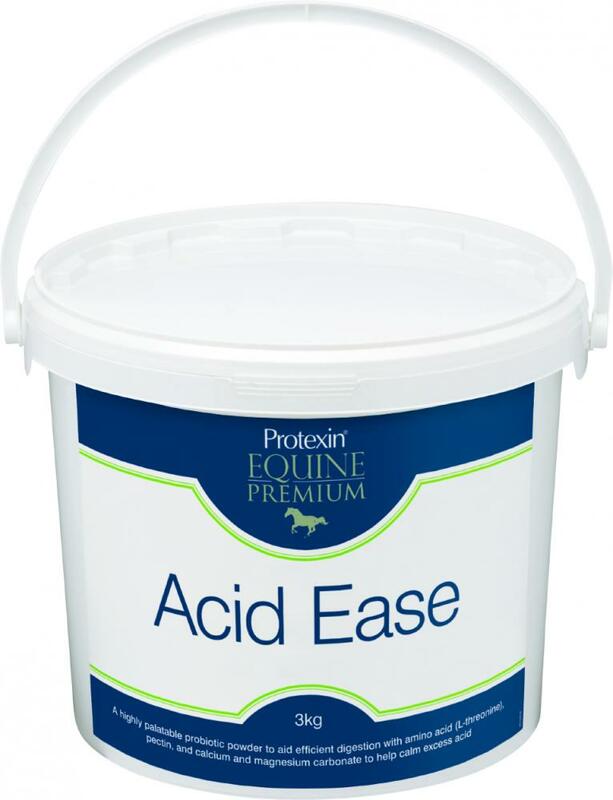 Acid Ease contains no known prohibited substances as defined by The Jockey Club and the FEI, and carries the FEMAS BETA NOPS logo.